This luxury Organic Mother’s Day Hamper contains some of our most luxurious products, so you can make this Mother’s Day one to remember. -Herbal Foot Balm 60ml. contains our own wildcrafted comfrey. Deeply moisturising, great for tired and overworked feet – ultimate care. – Love organic essential oil blend 10ml a wonderful loving blend containing oils such as jasmine to soothe the mind and emotions. 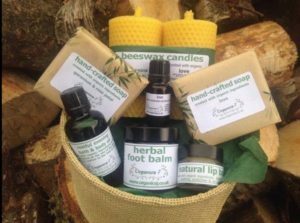 The candles are made with natural beeswax, contain natural cotton wick, and are scented with our new Love blend, plus all other products are made with ingredients that are 100% organic (includes wildcrafted comfrey in the herbal foot balm). The competition closes at 5pm on Thursday 23rd March, so we can get your luxury hamper to the winner, which we hope will get to you in time for Mother’s Day. This competition is open to all residents of UK.